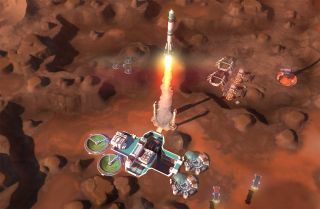 Offworld Trading Company was announced last May as an "economic RTS" being developed by Mohawk Games, the indie studio founded by Civilization 4 Lead Designer Soren Johnson. We haven't heard much about it since, but today publisher Stardock Games unveiled a trailer featuring the first look at gameplay and a few words from Johnson about what's in store. The game takes place on Mars, "the final frontier on which dreamers and entrepreneurs can make something of themselves" by staking out and developing claims to the planet's abundant and untapped resources. Players must buy and sell materials, resources, and even food and water on a real-time, player-driven market, but there's more to it than simply buying low and selling high: Dirty tricks and underhanded market manipulation have their place too. Hey, it's a tough world. The developers have been playing the game for quite awhile now, but Johnson said the studio is looking forward to getting more players involved in the process through the upcoming Early Access release. The Early Access version of Offworld Trading Company will offer head-to-head and free-for-all online multiplayer matches, a single-player campaign, and a skirmish mode against the AI. "We don't want to develop this game in a vacuum. In fact, we believe that players understand games often much better than their designers do," he says in the video. "We've been playing Offworld for a long time, we've been having a lot of fun with it, but we feel like there's no way we'll be able to bring it to the next level until we're able to see what happens once players out in the wild start playing it." The Early Access release of Offworld Trading Company will hit Steam on February 12, but can be pre-purchased now at a ten percent discount at offworldgame.com.